What a wild weather day today - I don't remember there being tornadoes in October before! We are all fine here, there was an E﻿F-2 Tornado about 15 miles from us, thankfully no one was seriously injured there. I was beginning to think my muse blew away with the wind, as I had planned on being in the studio today, but found myself watching the weather outside instead. I did manage to head back after dinner to create this card. In place of the circles I've added some Zva Flourish Pearls. 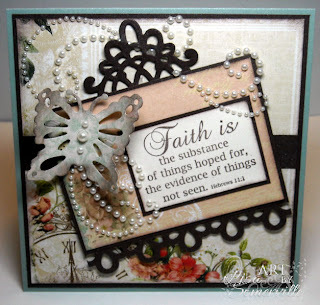 The Butterfly and Decorative Edges are from Heartfelt Creations Decorative Butterfly and Border Die . I stamped the sentiment from Heartfelt Creations Faith Heb. 11:1 set in Chocolate on a Vanilla Panel, then layered onto a Chocolate panel. The beautiful papers are Websters Pages (thanks Sue!). 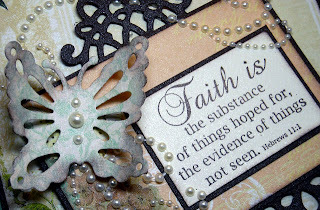 I finished off the card with a light misting of Perfect Pearls Spray in Pearl - gotta love the added shimmer! Finished Size 5-1/4" x 5-1/4". OH MY GOSH, this card is stunning!!! Most definitely FRAME WORTHY!!! I love that scalloped frame, all those pearls and that awesome butterfly, love the sentiment too. Oh WOW! Quite lovely! Sounds like you needed faith to get through this day! Happy to hear it missed you. I've been through 3 tornadoes and it's not fun! Lisa, I'm so glad your muse wasn't gone with the wind! The storms sound scary. I heard about the midwest and the bad weather there. Parts of our state are in for tornados and such tonight. We are a little east of the danger zone. Your card is very elegant. It was also one that made me hungry with the chocolate and vanilla. I love the butterflies and the "pearls". BREATH TAKING CARD!. I was raised around tornados and they are mighty scarry. West coast doesn't get many of them but then we deal with the earth quakes. Such a beautiful card. All the lovely embellies really help show off the scripture. Thanks for sharing with us at TT this week. This is a beautiful card, Lisa! I particularly love the pearl flourishes and the embellishment above the sentiment. Your flourishes and the way you angled your image really set this card off. Another beauty. Beautiful card and so glad to hear that everyone is fine there. What an inspiring card! Love the swirls and butterfly, and of course the uplifting sentiment. How did I miss this? Was this on the long trip day? Gorgeous card. Love the design and it is stunning.